As some of you may know, today was Small Business Saturday. Boy did I support some small businesses! 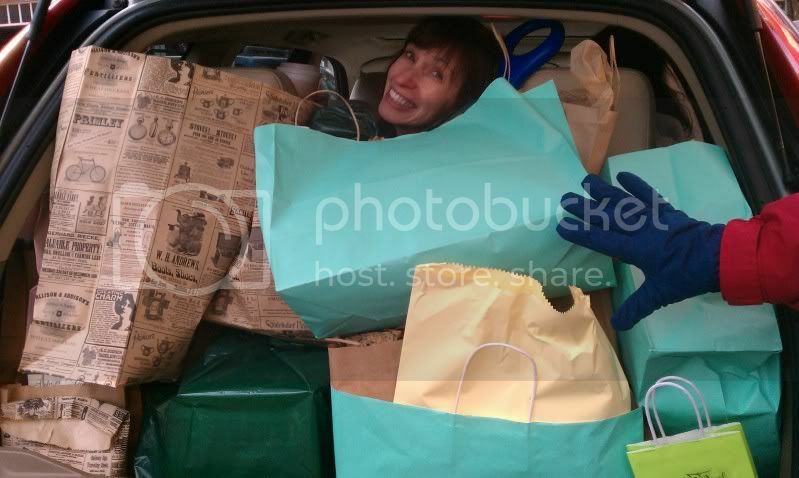 Aunt Lois with all of our purchases! All the guilt over spending like a crazy person is equalized by feeling good about supporting small business. What a great day. Yes yes, worry not - I am here. Minus a growth, plus a Keurig (which I have yet to use because I am so busy ALL OF THE TIME). I owe what, like, three sketches or something? I'll have them tomorrow. Maybe. We'll see. for a while now I have had a vague yearning for a Keurig machine. recently, though, it has become a more persistent need. Saturday did not help. on Saturday, while Chris and I were shopping for bathroom accessories, we went to Bed Bath and Beyond. 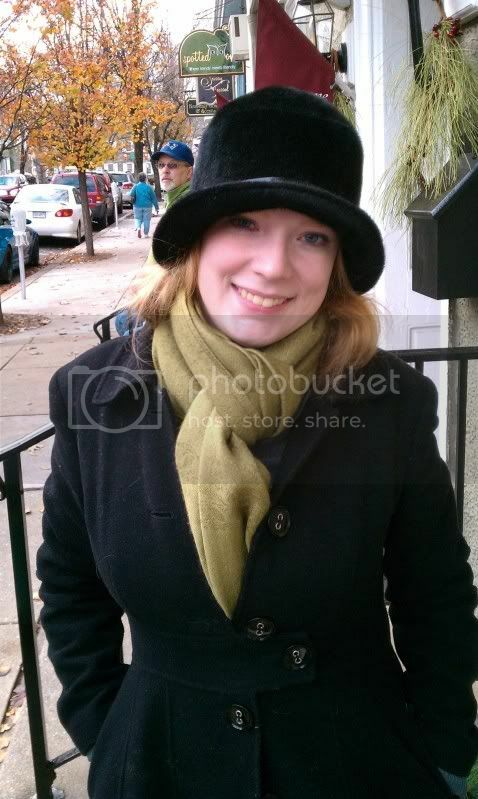 at BB&B, there was a Keurig lady giving out samples and doing demonstrations. I thought we'd get a little sample size, but no - she gave us each a full cup of free coffee (or tea, in my case). she also explained the finer points of Keurig use, which was nice. we both acted like we had never heard of a Keurig and I think it really paid off. I mean, not only did we get free drinks, but I did learn some new things about them. I had been intending to buy one, eventually, but probably only the cheapest one. the sales lady told us that the Keurig B-70 B70 Platinum can not only be programmed to shoot out a warm cup of coffee for me automatically every morning, but it also has a special iced tea/coffee setting. this excites me more than I can properly express in words. needless to say, I will definitely be buying one now, hopefully on Black Friday. and probably the platinum. so that Keurig lady did a good job, I think. Chris and I had a rough Saturday night. some time after we went to bed, I heard a sound downstairs. it sounded like someone (or something) banging against metal. maybe the railing on the side porch? 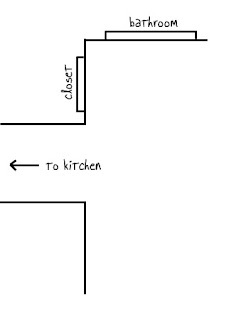 or perhaps something banging around in the basement? I waited a few seconds and heard it again. at this point I frantically started trying to wake Chris, which took several minutes because he can sleep through anything. eventually, though, he was roused and we went downstairs to investigate in our pajamas. he had a sword, I had my trusty axe. we couldn't find any signs of break-in, but the back porch light was on nonetheless. you see, the switch to the porch light is inside the house. totally weird. we went back upstairs and after a few minutes we heard it again. in a panic, we ran back downstairs. even with another full house inspection (basement and attic included) we could not find anything amiss. with nothing else to be done, we went back to bed. Chris fell asleep after about twenty minutes, but I strained to hear suspicious sounds until I eventually succumbed to exhaustion. when we went to bed the following night, I was still pretty nervous. if we could have just found a cause for the sound I would have been okay. but finding nothing except a lit back porch light? that's a bit troubling. this is going to sound dumb, but the only thing I could think of was Paranormal Activity 2, which we saw a few weeks ago. perhaps a demon or ghost was after us. feeling sheepish, I mentioned this to Chris. "yeah," he said. "I was thinking the same thing." this sent me into an unrelenting panic. you see, when you think of these things as a child, you have parents to protect you and explain things away. now, however, I have Chris to protect me. and to tell me that yes, he also suspects that the bumps in the night are probably caused by ghosts and/or demons. as some of you may know, I have had a... growth on my upper thigh for about a year and a half. some of you have even had the honor of viewing it. to those of you who have not: count yourself among the lucky. just about everyone who has seen it has recoiled in horror. but anyway, I finally went to the doctor about it last Thursday. it's gotten noticeably larger over the summer and I was/am starting to become rather alarmed by it. my doctor thinks it is a dermal nevus. 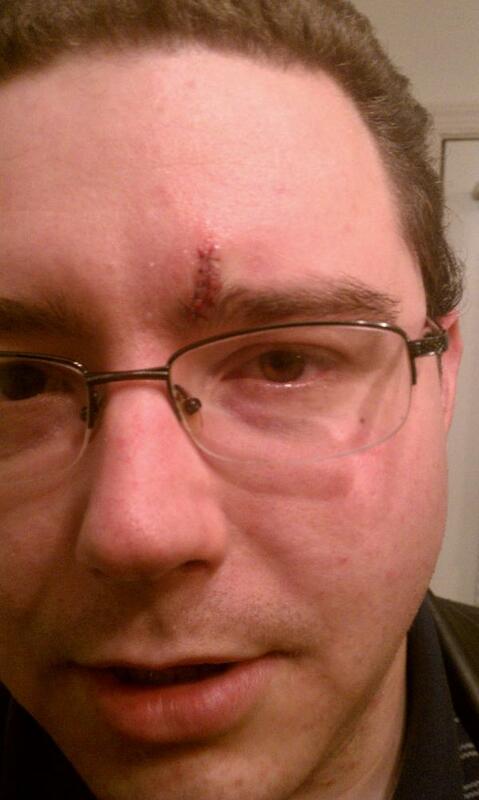 I have an appointment with a dermatologist on Friday to hopefully have it removed. hey look, it is on time this week. how unusual. 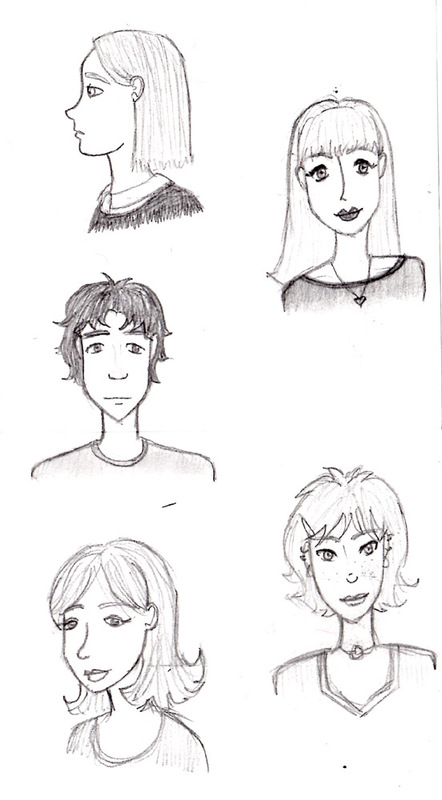 mostly just some random people, two sketches from Death in the Clouds by Agatha Christie. it is anime night at SteveMikeBobby's house. all the lights are out for maximum viewing pleasure. Chris goes into the bathroom to clean off his streaky glasses. he turns off the bathroom light as he exits. he cuts the corner a little close when attempting to enter the kitchen. in the living room, we hear a loud thump. we ask if he is okay, and he responds that he is fine. there is a 30 second pause before he calls out to us - "maybe I am not as fine as I thought..."
long story short - he need five stitches in his eyebrow. so you can see how that could cause a delay. I don't really have an excuse for the rest of the week except usual busyness and lazyness. but now you get two sketches together - isn't that exciting? 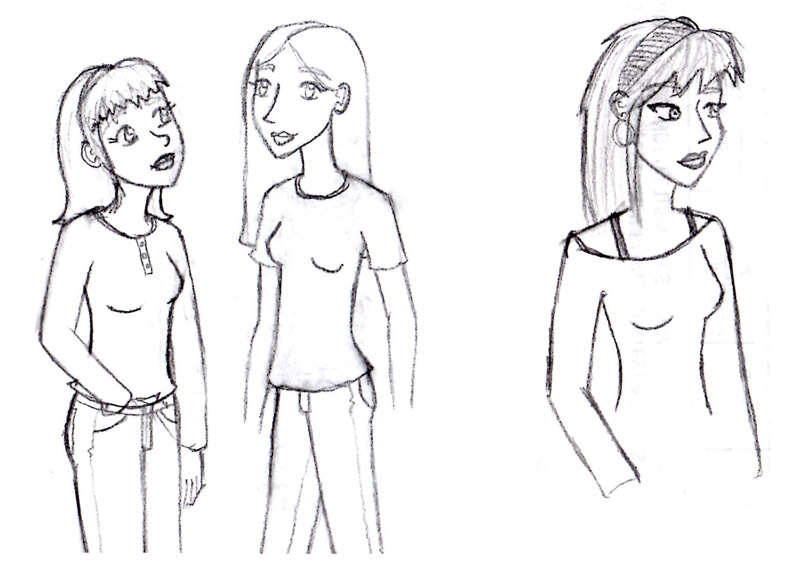 these are some more characters from the same comic idea featured in sketch 43. the girls featured in sketch 29 are also from this idea. and sketch 22? that's just an old sketch of the girls in 29. crazy, isn't it? the one on the left is my creation, there really isn't any story there. 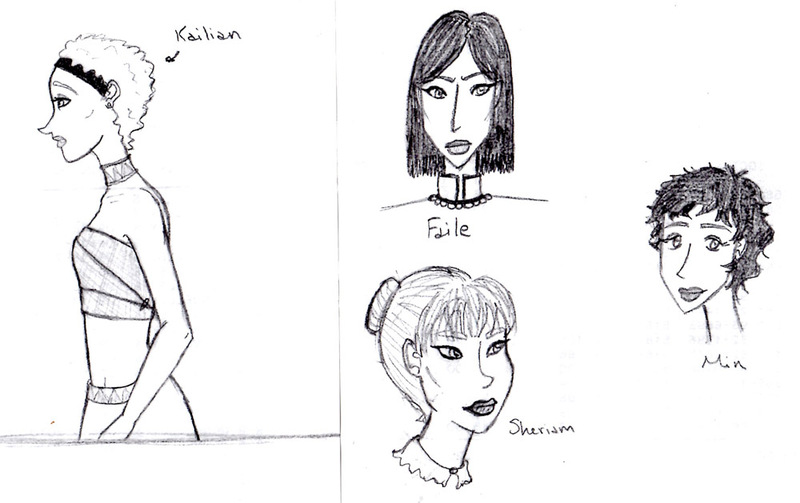 the girls on the right are from Wheel of Time, which has been quite the preoccupation this week. we are about a third of the way through the Towers of Midnight audio book. so here it is, the last week of my October money diary. yes, this week is a few day longer than a week should be, but it seemed silly to do a post for a tiny week portion. so I just lumped it all together and you're just going to have to live with it. that's a grand total of $996.82!!! wow, that's a lot. I mean, I was expecting a lot, but still. That's impressive and terrifying. in fact, I think that's more than the other three weeks combined! wow. but anyway, if you add them all up, my total for the month is $1801.04! that's a daily average of $58.10, for those of you who like to obsessively break things down the way I do. this little money diary experiment was pretty exciting. mostly my spending is pretty much in line with what I expected, but it is interesting to see everything in spreadsheet form. for example, I know that this month I spent more on restaurant food than I did on utilities. that's interesting, don't you? it just really puts things into perspective. another thing about the money diary is that I really enjoyed tracking everything I spent. I enjoyed it so much, in fact, that I am going to continue doing it in November. don't worry, I have no intention of doing weekly blog posts about it this time. however, when January rolls around, you can expect to see weekly posts again. in January I intend to try and cut down on unnecessary expenses to see what I can do to (reasonably) cut costs. it'll be fun!